Archival, Acid-Free, and Photo-Safe. 50 Clear Pages / Shaded Backgrounds. Photo Album 300 4x6 Brown Leather Look with cute Cover Photo Space. Condition is New. Shipped with USPS Priority Mail. Hello! This is a vintage photo album made by Pioneer. It is from 1988. This album holds up to 300 photos, up to 4"x6" and panoramic size. There are 100 page/50 sheets. Each page has 3 slots for photos. There is a memo spot next to each photo for writing important dates and notes. This photo album is a red/burgundy color. This would be so cool as a place to hold family photos with a vintage touch! This item is new, still in the plastic case. Despite this, there is some wear from age and storage. Please see all photos before purchasing! Dimensions: 13.75 x 10 x 1.5 inches Please let me know if you have any questions. New In original factory shrink wrap. 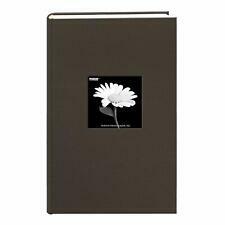 The Warm Mocha DA-300CBF Fabric Frame Bi-Directional Album from Pioneer Photo Albums is designed to hold and display 300 3-up style 4 x 6" photos in a horizontal format or 100 1-up style 4 x 6" photos in a vertical format. Each archival, acid-free, and photo-safe page in this 50-page album has a memo area, so you can write a note or information to identify the photograph. The pages also have shaded paper backgrounds next to the memo area. The cover has a 3.75 x 3.75" frame so your favorite photograph can be displayed on the front cover. The heavy-duty, capped binding will help protect your binder and pages, while Archival and Acid Free Paper will help protect your photos and notes. Also includes storage room for 6 CDs and 6 Index Prints. Page Market Ribbon and Fabric LIner. Optically Clear Pockets Securely Protects Photos. Bookbound Album. Estate sale- Photo Album - holds/ 300 pockets holds all size photos up to 3 1/2 x 5 " ( 35 mm). I have a quantity of 4 albums: two crimson/maroon and two slate blue. From Pioneer. Holds photos up to 31/2" x 51/4". -Clear plastic pockets securely protect photos. A Photo Album. The album is new. White color. The Pioneer MP46 Full Size Photo Album has a durable and washable Endurahide leather-like cover with gold accents. It holds 6-up photos per page. Includes 25 pages for (300) 4x6 photos. Holds six 4" x 6" photos per page. 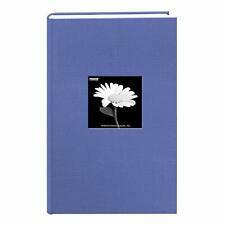 This is a Pioneer Photo Albums MP46-WHS Full Size Album (6 Pages/White). It has patented pages that feature six 4x6 optically clear pockets with a shaded paper background. The deluxe color covers are accented with gold-tooling and a "Photo Album" emblem on the spine. Photos are displayed two per page. Archival, photo safe: acid, lignin and PVC free. 3-up album holds 300 photos up to 4"x6". Patented Bi-Directional pockets hold horizontal or vertical photos. Perishable products like food have over 1 year shelf life. Holds 300 4" x 6" photos. Perishable products like food have over 1 year shelf life. Color - Black. GREAT SERVICE. We usually respond within a few hours 24/7 including weekends. Photo Album Binder. Pockets For CD's & Negatives. Brown Faux Leather. Holds 300 4" x 6" Photos. With The Exception Of A Light Smudge Line On The Front Cover, Album Appear Unused. Color - Wildberry Purple. Photos are displayed two per page. Archival, photo safe: acid, lignin and PVC free. 3-up album holds 300 photos up to 4"x6". Patented Bi-Directional pockets hold horizontal or vertical photos. Photo Album Holds 300 4"x6" pictures 3 per page. Condition is New. Shipped with USPS Priority Mail. 3 available. Sold separately. THIS CHRISTOPHER VINE DESIGN. FLORAL PHOTO ALBUM. THE ALBUM HOLDS 4" X 6" PICTURES. ALBUM WAS NOT USED FOR PICTURES. 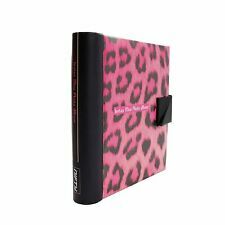 ❤ Photo Album Pioneer 300 Pocket Post Bound Black Leatherette Cover For 4" X6"
This leatherette photo album features gold accents on the cover and "PHOTO ALBUM" on the spine. Uses refill 46-MP. Photo safe: Acid, lignin and PVC free. Leatherette gold accented cover and spine. Holds 300 4"x6" prints. 5 out of 5 stars - ❤ Photo Album Pioneer 300 Pocket Post Bound Black Leatherette Cover For 4" X6"
1 product rating1 product ratings - ❤ Photo Album Pioneer 300 Pocket Post Bound Black Leatherette Cover For 4" X6"
This is a BEAUTIFUL photo album. The back pages have spaces for picture CD's, Matching Index Prints, and a large envelope on the inside of the back cover for Negatives and Index Prints. The wildberry purple DA-300CBF Fabric Frame Bi-Directional Album from Pioneer Photo Albums is designed to hold and display 300 3-up style 4 x 6" photos in a horizontal format or 100 1-up style 4 x 6" photos in a vertical format. Each archival, acid-free, and photo-safe page in this 50-page album has a memo area, so you can write a note or information to identify the photograph. The pages also have shaded paper backgrounds next to the memo area. The cover has a 3.75 x 3.75" frame so your favorite photograph can be displayed on the front cover. Looks like never used! Still has plastic sheath on outside, took this off for photos. Very last page got caught in plastic film and wrinkled up but not torn. See photos. Holston Madison Collection Ivory Photo Album Hold's 300 all size photos up to 5X7". This bound album features a durable design cover and holds up to 300 horizontal or vertical 4x6 photos. Clear pockets with natural brown paper background. Capacity: up to 300 photos. Archival, acid free, photo safe. 3 Ring Photo Album 300 Pockets Hold 4x6 Photos Gray. This photo album features a leatherette cover with gold stamping. The 3-ring binding accepts refills (Style No. Photos are displayed three per page. ). Elegant looking 300 photo holder. Gold Fabric. The Pioneer CLB-346 Sewn Bonded Leather Bi-Directional 300 Pocket Album, Burgundy features a burgundy leather cover and is designed to display and protect 300 4x6" photos. The 3-up style pages can display three horizontal or two vertical images per side. It will also accommodate one vertical APS panoramic image per side. The clear, side-loading pages protect your photos from dust and fingerprints. The shaded background on each page enhances the presentation of your photographs. There is a memo area next to each photo. The book-bound binding enables the open pages to lay flat for quick loading and optimal viewing. The album is acid-free for long-term archival photo-storage. The actual photo album shown in the photos. Photos are displayed two per page. Archival, photo safe: acid, lignin and PVC free. 3-up album holds 300 photos up to 4"x6". Patented Bi-Directional pockets hold horizontal or vertical photos. Color - Green. Photos are displayed two per page. Archival, photo safe: acid, lignin and PVC free. 3-up album holds 300 photos up to 4"x6". Patented Bi-Directional pockets hold horizontal or vertical photos. Color - Red. Gold and Off White Flower print. Elegant looking 300 photo holder. Black Photo Album. Leather-like cover with decorative vine-like detail. Holds 300 4x6 Photos plus a cover photo. Photos are slipped in from the side. From TYM Treasure Your Memories. Designed in Palm Springs. Made in China. Acid Free, Archival Safe. Condition is New. Measures approx. 8in wide x 13in tall x 2in deep. Ships with USPS.